This is a very rare and hard to find tray from the 1930s. The scene shows a bottle of Centennial beer with the background being a historical rendering of Fort Defiance in 1794, which was an important outpost protecting the American frontier from English and Indian attacks after the revolution. 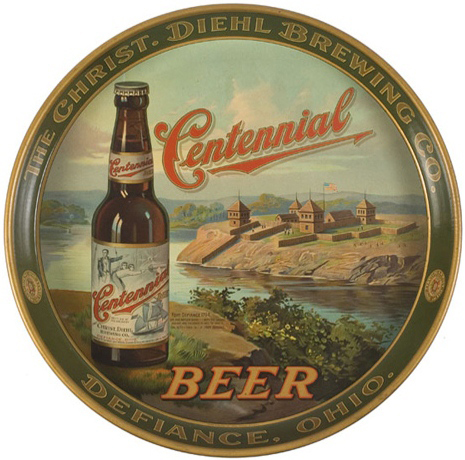 The town of Defiance, Ohio was later established in the same location and was where the Christian Diehl Brewing Co. was based. This tray is a 12″ round produced by the Shonk Co. of Chicago. Overall this is one of my favorite post-prohibition trays for the great detail in the imagery as well as the connection to American history.